Occasionally, my blog articles read a bit like a diary, and today’s article will definitely feel a bit like that. Please feel free to stop reading now if you that bores you. Earlier this week, my phone died. On Tuesday morning I discovered that my HTC Evo would only continuously reboot, and it wouldn’t load up. I needed a new phone. By Saturday (today, July 21, 2012), I was in serious phone-withdrawal mode. At least I was able to tweet now and then from my Kindle this week. I knew that today, I’d be the first person in the door when the Sprint store on Union Street opened up. I started the day by dropping by Evolution Fresh and grabbing a Southwest Scramble for breakfast. I didn’t plan my morning very well, since I didn’t know what time the Sprint store actually opened. (Turns out, it opens at 10:00 a.m. on Saturdays.) 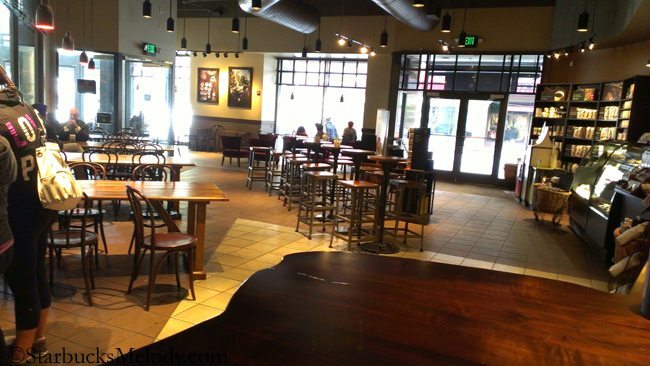 By 9:30 a.m., I was sitting in the Starbucks at 6th & Union, directly across the street from the Sprint store. I drank coffee, played Words With Friends on my Kindle, and waited impatiently for Sprint to open up. Just a few minutes after 10:00 a.m., I walked into the Sprint store on a mission that I would walk out with a working phone. You have no idea the phone withdrawals I had been going through this week. I was inside the Sprint store for a full hour, possibly more. There was a short conversation about whether my phone could be repaired. The prognosis didn’t look good. The Sprint employee, Patrick B., informed me that I was eligible for an upgrade, and he pointed me in the direction of the newest HTC Evo, which is the HTC Evo 4g LTE. I quickly fell in love. Patrick set up the new phone, showed me some of the settings, adjusted a few of the settings to my liking, and helped me pick out a sturdy case for the phone, as I’m a bit rough on my phone. We even charged the phone for a few minutes. I walked out on cloud nine, new phone in hand. I walked back across the street, back into the 6th and Union Starbucks. Of course, now all I could do was play with my new phone. I ordered a beverage, and began to take photos and play with my new toy. I tweeted my first photo with the phone. The store wasn’t all that busy while I was there. 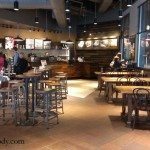 I knew that I was way overdue to write a blog post about this Starbucks, so I began to take a whole series of photos of this store. 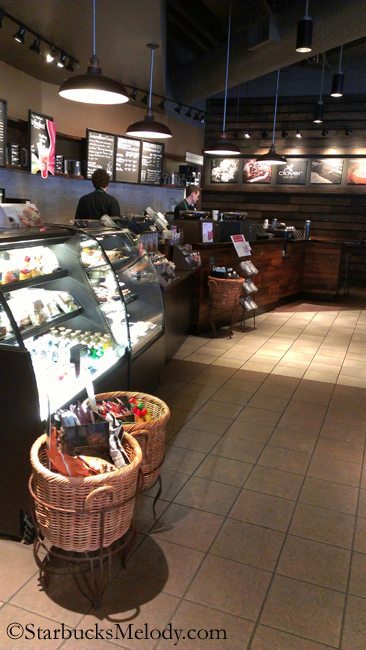 While I was there, I made small talk with Yung, the assistant store manager, and some of the other partners. A coffee-enthusiastic partner named Andrea was working that morning too. I was having a great time. I met Yung some time ago when he was a shift supervisor at 1912 Pike Place. It’s always good running into him. He’s very passionate about Starbucks, and very knowledgeable too. 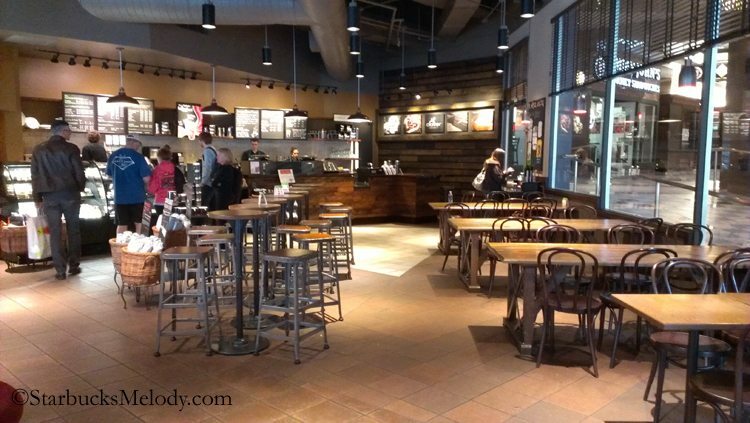 It’s funny how customers seemingly come in in groups, and then the store empties out. While I was taking photos, the store began to pick up, and several customers walked in. I continued having fun playing with my new phone and taking photos. I approached Cliff and chatted with him for a few minutes. I’ve run into him before. In fact, I have a whole category of Cliff Burrows articles on this blog. He asked me if I had been to the new Evolution Fresh, and if I liked it? I told him I was there the morning it opened, and that I was definitely enjoying it. I had no need for a kitchen anymore! He laughed. 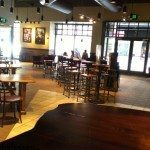 I suggested to him that I’d love to see another Clover location in Orange County, and gave him a suggestion of the store I had in mind. He took it seriously, and took note of the Starbucks store that I mentioned. Every interaction I’ve had with Cliff Burrows has been positive. And I have heard many a partner in downtown Seattle tell me they’re a fan of Cliff Burrows too. 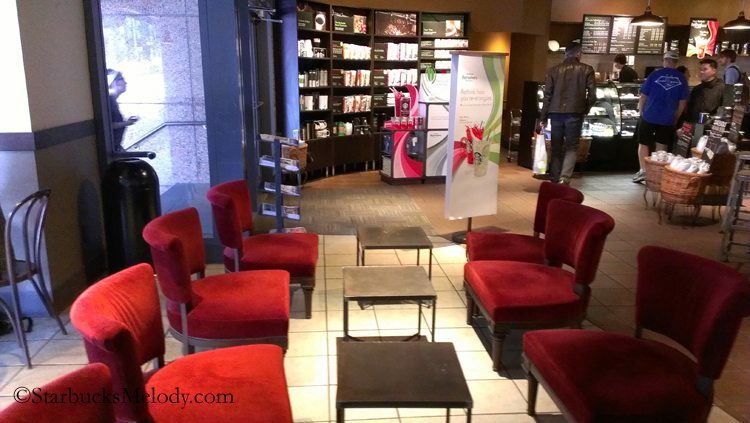 And if you’re in the area, drop by 6th and Union Starbucks. 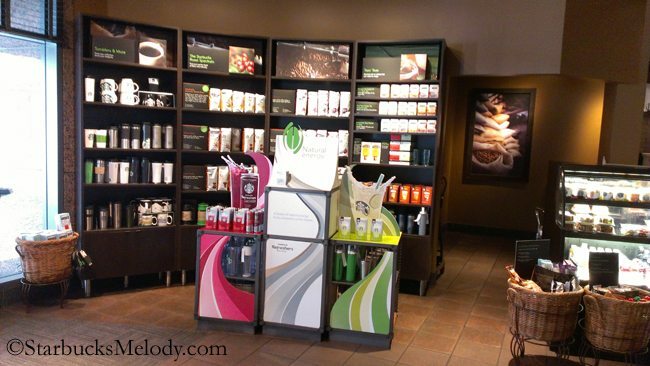 It’s a huge, beautiful store with a Clover brewer and a great team of partners. This store was also one of the earliest stores to have a Clover brewer. I think this store got their Clover in late 2007. Last but not least, “Kurt” was the winner in my last blog contest. Please email me Kurt! I’ve always enjoyed this store when I’ve been in it. 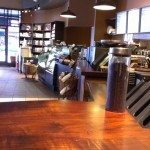 @Melody – You missed your chance to upgrade to a Sprint iPhone so you could get a Starbucks iPhone case! CD I had the same thought as you re Melody not getting her iPhone but melody you seem so happy. Have fun with the new phone. Pics of store are great. I really liked the interaction you had with Cliff. Btw next time you see him tell him to bring Evolution Fresh here and you can give him my email address! It was nice to also see such partner passion as well. Nice store – I don’t think I’ve been in this one. I Cannot believe you didn’t get an iPhone given the case that you have had me drooling over for days!!! But I am glad you are enjoying the new phone. I will say again, as always, I hope we get a Clover/ Reserve store here soon! @Hayley – Oh I seriously considered switching to an iPhone just to have the Starbucks logo iPhone case, but everyone seems to have an iPhone, and I really have been happy with Sprint & the HTC phone, so I just couldn’t make the switch! @DadCooks – Get well soon! I’ll do my best to keep you entertained here. 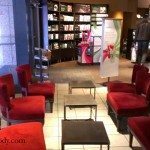 I’m a prolific writer and Starbucks keeps giving me lots of material! I feel a bit dense, but I’m still not actually sure what a Clover machine is. I get that it makes coffee, but are we talking espresso or brewed coffee? What makes it special? Beautiful store Melody! You have to understand that it almost maddens me every time I see a new or re-modeled store…given that I (and every single person I’ve talked to about it) feels we got SO screwed over with out non ‘re-model’. I’m not that vicious that I really am not happy for everyone else but really, we got so so screwed. Anyway, interesting story about your morning and phone, too! (I just upgraded, for no reason, to a new phone and it’s been hell learning it…… need a 12 yr old for more help) The sales person at Best Buy said really, give it at least a week to learn and re-adjust. Another (very techy, brilliant friend, who is also my AGE) said: she thinks a month. Dad Cooks best wishes for a speedy recovery and hope your family is bringing you delivery of your favorite SB drink. Denise R I got my first iphone in December and freaked out over using it but quickly got into and love it! Look back now in amazement at how scared I was in getting it! 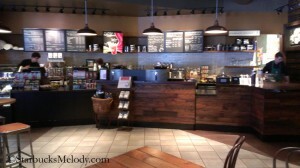 Melody, I agree with Denise R about the difference in remodeling from store to store. Today, I looked at one sofa in my local store it was somewhat torn and so sad looking! I know the remodel is coming but no date yet set! The pics here make me so jealous and it seems there are remodels that move so fast around by you. @Lena – The Clover brewer is a special high tech coffee brewer where a barista selects a setting just for your coffee, and hand crafts an individual cup of coffee just for you. It works something like a French press, turned upside down with unusually specialized filter, It’s a vacuum press technology. 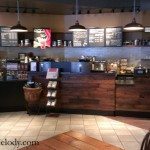 Coffee enthusiasts tend to debate brew methods, and often suggest – and this is TOTALLY true – that the brew method really changes the flavor of the coffee, depending on the brew method you use. I.e., a single origin Kenya coffee tamped, with high pressure water, and as a shot, is totally different than making that Kenya in a French press. And some coffees do better with one brew method over another. 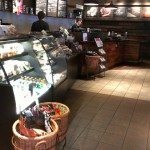 Generally speaking, many coffee enthusiasts suggest that a single origin coffee – such as one of the Starbucks Reserve offerings available only at Clover stores – is great as a Clover brewed coffee, and that that is where the Clover shines the most. At the end of the day, what coffee you like is subjective. @Kurt – if you’re out there, please email me! I emailed you already. You have a prize to claim from last week’s Dale Chihuly Card giveaway. @DeniseR – What kind of phone do you have? I only use my phone for talking, tweeting, and reading on the internet and not much else. I’m not a big texter. I tend to wait until my phone is fried before I go get another one. My old phone was so bad that there was no way to import my contacts. I don’t have anyone’s phone numbers anymore! http://www.starbucksmelody.com/2011/07/10/first-and-pike-starbucks-a-unique-and-gorgeous-clover-store/ — Those are the lights that say “Fresh Roasted Coffee” on the bottom of them, and store design only rarely uses these lights, I notice. They are, by far, a favorite of mine. They’re elegant and look like they belong in a coffee house! ROFL – Amanda, you are great! Thank you. I never did comment on the lobby but I meant to…it looks huge! I guess the only downfall is the comfy seats don’t look very comfy to me. Which store in Orange County?! It’s so cool that you got to meet Cliff! 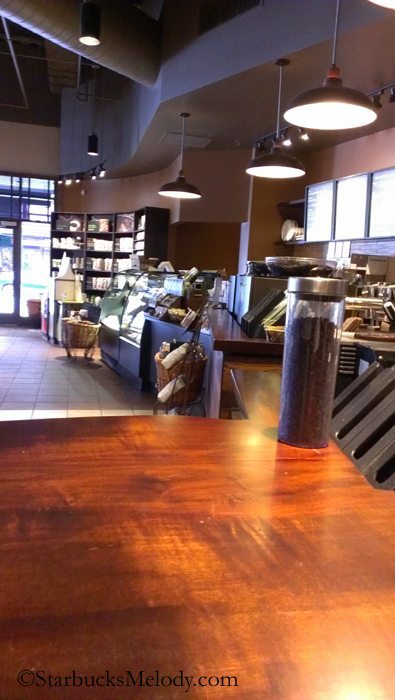 Certainly nice to see one of the higher-ups visiting a local Starbucks…well, I guess everyone needs a cup of coffee haha. Melody, I’m new to your site and really enjoyed the posts! Will be back for more! So jealous! I wish we had one here. I would even love to help open one, but I am not sure if they would consider Partners to help. Somehow I posted on the wrong one. It was supposed to be on the Evolution Fresh one. Sorry! We just opened a Clover about 45 miles away from me. Planning to make a visit someday. I had my first Clover experience the other day and I was impressed! It was nice to get a cup of iced coffee with the brew I wanted rather than whatever is being brewed as iced coffee that day. Hooray for Komodo Dragon! @Hayley: I wish I could post some pics of some REALLY not-so-comfy-seating in a new re-model…. It’s all relevant I guess. @Diele – I wish I could move a comment but I can’t. The Evolution Fresh article still appreciates it. 🙂 @DeniseR – This blog’s facebook page is an option for showing off your own pics. 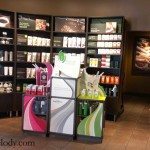 i love reading your reading your blog i am a starbucks fanatic i collect everything starbucks there is a starbucks in a grocery store near my house i go every week your blob is realy a joy to read keep up the brilliant work and thanks again for having such an awsome blog. but they only show what they want…..
@Melody: re-read > re-post! I read your comment to me re: FB page as Sbux FB page. So, in that case, yes, I can do as suggested. I just have to take more pics now since new phone (pics were on) and new computer (pics were on). will do that! posted a couple pics on this sites FB page of our sad sad ‘remodel’. Couldn’t take all I wanted to today because it was amazingly busy with this “cold front” (only a muggy 88 today) that we’re having today!